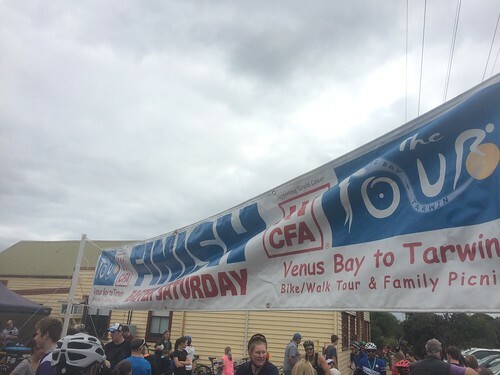 Now in its 11th year, the Tour De Tarwin Easter Festival is South Gippsland’s largest fundraiser for local emergency services. Our Walk, Run, Ride event on Easter Saturday, Beach Fun Run on Easter Sunday, 4-day Fishing Classic and our ‘U Beaut’ raffle all raise vital money for the CFA in Tarwin Lower, Venus Bay Surf Life Saving Club and CERT to purchase equipment, vehicles and communication devices to help keep our communities safe. Our all ages events are fun and healthy. Bring the whole family and join in the fun. Faster runners and slower bikes; a novel form of obstacle racing. Runner beware – you will be mixing it up with young riders who will deviate from their line, stop suddenly and drift into you. Some of this is due to the camber on the bike trail, some due to inexperienced riders. I was involved in three tangles with bikes during the first half of the run, no serious damage but there is the risk of being cleaned up – the take away message is that you need to run at a pace that you can avoid the heavier collisions. It was always the plan to come for the festival and not for a race, and in fact we had run parkrun at Inverloch in the morning before coming out to Venus Bay so we didn’t run on race fresh legs. I was expecting the listed 6km run length so was a bit surprised when we ran into Lower Tarwin and through the finish banner at 4.7km. After running back to run with the rest of our party a couple of times, we made our way to the Lower Tarwin pub for some “carbo loading” and live music.